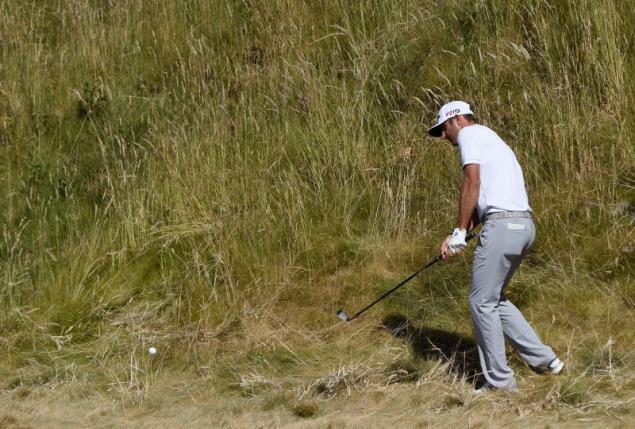 WASHINGTON – Big-hitting Dustin Johnson used power and precision to move two shots clear midway through the U.S. Open final round on Sunday as a thrilling charge by Rory McIlroy ultimately fell short. Masters champion Jordan Spieth, who offset a bogey at the first with a birdie at the eighth, was tied for second with South African Branden Grace, both players having completed nine holes. Australian world number 10 Jason Day, whose title bid had been in severe doubt on Friday after he collapsed due to vertigo before finishing the second round, was a further stroke back at three under, also after nine. Spieth, Johnson, Grace and Day had been joint leaders overnight but the 21-year-old Masters champion slipped back with a three-putt bogey at the first on a picture-postcard afternoon in the Pacific Northwest. Day and Grace both stumbled with bogeys at the par-four fourth, where Johnson sank a 13-foot birdie putt to forge two strokes clear and pump his fist in celebration. Johnson, seeking a first major title after coming close at both the U.S. Open and PGA Championship in 2010, also birdied the eighth after hitting a superb third shot to three feet and reached the turn in two-under 33. World number one McIlroy sent a tremor of excitement across the course as he racked up six birdies in his first 13 holes to get to two under for the tournament, just two off the lead. The Northern Irishman drained a curling 70-footer at the par-four 13th to spark thunderous roars from the grandstands but then bogeyed the 15th and 17th on the way to a 66, and a level-par total of 280. “I hit some good shots early on, made some nice putts and just got a little bit of momentum going there,” McIlroy, who won the 2011 U.S. Open at Congressional by eight shots, told reporters. Low scoring was plentiful for the early starters on a par-70 layout made more receptive by overnight watering and set up at its shortest yardage of the week.